The attached footage was captured on Sunday morning in Williamsburg, Brooklyn. 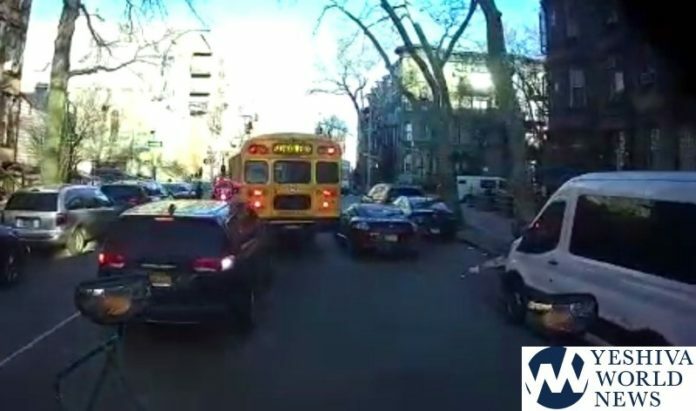 Watch how the bus turns on his red lights to pick up a young boy heading to Yeshiva, and a car speeds around the bus. This happened on Bedford Avenue and Hewes Street. Just a few weeks ago, YWN reported that NY Governor Cuomo wants school buses in New York state to be equipped with cameras to record drivers who illegally pass stopped school buses. Previous articleSOLD OUT EVENT! Would You Still Like to Attend The Kosher Food and Wine Experience? Is YWN the new traffic enforcer? Hey Meshige…..YES!! Anyone who can identify the car from the YWN video by magnifying its license plate and reporting the number to the police (along with the YWN video) would be a real hero and may save a child’s life by placing your meshige friend in jail. He deserves a ticket but he didn’t exactly “blow past” the stopped bus. Can you post the plate number? This is an obvious disregard for the safety of any child that might be getting on or off the bus at that time. The car drove past a bus while the red flashing lights were on! Driving is not a right, it is a privilege. Those that blatantly disregard the law should not be allowed to drive. Yes, this driver should be ticketed and points placed on his license, as driving is an advantage for those who follow its’ laws. I wait with my children at a school bus stop. We had bikes, motorcyclists, cars and SUV’s drive by the bus while it was loading. I have already observed countless almost. Hashem lo Yishan, Hashem Shomer Yisroel! And we should not stop davening. That car was not speeding, except in the technical sense that the speed limit for that car at that moment was zero, and it clearly exceeded it. The car seems to be going slowly and carefully around the bus, in a manner that would be considered very reasonable if it were legal. But it’s not legal, and there are some traffic laws it’s just not OK to break, even if you think you can “get away with it”. There is an עינא פקיחא, and hopefully there will soon also be a camera to issue automatic tickets. Tell me on your kids busses are they all seated or standing on the drivers head? Does the driver wait till every child is seated before driving? Jack green, this video is not about the drivers. when there is a flashing red light one may not pass regardless of if the passing car is frustrated etc.